Washington Capitals General Manager George McPhee will have executive decisions to make this off-season, as any GM around the National Hockey League does, especially when it gets closer to the start of Unrestricted Free Agency, scheduled to begin on July 5th, 2013. From a defensive standpoint, veteran Tom Poti’s contract has an expiration date this summer and it’s likely the 35 year old will be seeking employment elsewhere, if in fact his health, permits. Defenseman Karl Alzner is set to become a Restricted Free Agent and will most likely work out a new deal with George McPhee, keeping the Burnaby, British Columbia native, in DC for the long haul. That would leave the Parent Capitals blue-line with seven contracts on the books for the start of the 2013-14 campaign. However, if long time Red Shirt Jeff Schultz has anything to say about it, he will be wearing a different colored sweater, per his request. The veteran defenseman has requested to be traded following several frustrating seasons, with playing time on the decline. The 27 year old had previously asked to be moved at this years trade deadline, due to finding his way down the depth chart of the Capitals blue line. A part of the frustration lies with Head Coach Adam Oates and former head Coach Dale Hunter in their approach with him and not fully explaining the reason for decreasing his playing time. 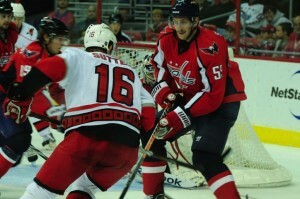 Schultz, drafted by the Washington Capitals in the 2004 NHL entry Draft, has played in 399 career regular season games, all with the Washington Capitals, compiling 11 goals and 75 points.